"My mind's got a mind of its own! ", sang Jimmie Dale Gilmore, "It takes me out walkin' when I should have stayed at home." Ronnie "Stray Dog" Hall's mind has taken him out walking his whole life. It took him to the Army, to Korea, to Viet Nam, afterwards to a veteran's hell. 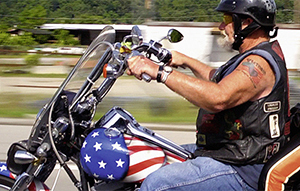 When we meet him he is an aging rebel biker trying to rehab his life. Ever the rebel, Ronnie Hall's mind is now rebelling its way back to Earth. Ronnie is the subject of Debra Granik's documentary Stray Dog, a film that is, in a sense, a sort of footnote to Granik's preceding drama Winter's Bone. Both are set in the backwoods of Missouri's Ozark Mountains and the backstory is that Granik recruited Hall to appear in Winter's Bone to boost the film's authenticity and then on reflection did a doc about her 'discovery'. Though the question arises of who is using whom. Hall is too smart to be the naïf he appears to be and this could also be the point Granik is trying to make. Granik walks the razor-thin line between exploitation and revelation in Stray Dog. She seems to have nothing but honest respect for Hall and is herself smart enough not to make a condescending film about him, his life, his family, his neighbors, his world. We see him warts and all and it often seems to be all warts. Warts are the baseline norm here and when that happens, well, they aren't warts anymore. Get over it. At the same time we are wandering dangerously close to Tod Browning's Freaks territory. I believe Browning also had nothing but respect for the singular people in his film but Freaks also attracts gawkers. I've always thought the sly Browning had sent a subtext to that gawking audience that said, "Who are the real freaks here, you or them?" Is Granik doing the same thing in Stray Dog?... and perhaps in all of her films? And for the Liberal-elite gawkers in the audience, there is a bit of Margaret Meade anthropology and Marlin Perkins Wild Kingom as well. I can hear the narrative dialogue now, "I was taken to see the chief of the Hill People where he took me into the tribe and I saw their secret ceremonies and ate their food. And now watch as the fierce beasts roar down the highway while you are totally safe on the other side of the camera's lens." It's Carl Denham goes to Skull Island to film King Kong all over again. "Don't worry friends, nothing can go wrong here, I invite the press to take pictures." If you can cut away the dense cultural kudzu that engulfs Stray Dog, you find a genuine man troubled to his bones by his past and doing his damnedest to get his life right, as Allan Ginsberg said "... arguing with echoes of the soul." The question is, can he lose his past and still remain the authentic Ronnie Hall? Will he have to burn down his own mental village to save it?... questions that are neither asked nor answered in Stray Dog. The Viet Nam War colors the whole of Stray Dog and defines Hall. It's the most significant thing in his life even as he is trying to make his new wife and her sons centermost. Hall apparently builds everything he does upon a foundation based on the war, ironically the primary thing of which he wishes to be free. And so he soldiers on. Stray Dog was released in 2014 before Trump and before Ken Burns' Viet Nam series. This makes Stray Dog a sort of pre-deluge artifact free of prejudices that could have completely changed how the film would be made today. Nor can today's audience see it with the innocent eyes of 2014. Identity politics issues abound here and you may have to work to sympathize with Hall. To that end, I recommend to any one who is thinking of watching Stray Dog that they should first read Nancy Isenberg's White Trash, The 400 Year Untold History of Class in America, 2016, Viking Press. Come to think of it, you should read it in any case.